We are expanding our Education mission to include new programs and support groups to meet emotional, spiritual and practical needs of people in our community. Programs that welcome people in off the street to take advantage of the resources and care include regular Art Classes, Selah drop-in groups and Bible Study. Groups of volunteers undertake weekly Prayer Walks in the community. Alpha and ROW are offered from time to time and InterMission is on the horizon. And our Leadership Development program starts with FORGE. Open to everyone – join us on a drop-in basis on Tuesdays (5:30-7 pm). Try your hand at drawing, painting, sculpting or whatever activities our group has lined up on the day. Our Art Class is free to attend and open to anyone in the community. We appreciate donations of supplies. On Wednesday afternoons (2-4 pm) we invite women in from the street to access resources such as computers and free counselling, or to enjoy a craft activity, conversation and snacks. We also hold celebration day events such as Mother’s Day and Valentine’s Day, when volunteers pamper with makeovers, wellness treats and love. Our next Selah Spa Day is being held on Sunday, 29th October, and we’re looking for hair stylists, make-up artists, manicurists, photographers…who could give us an afternoon to support this event. A similar service will be developed for men in the future. 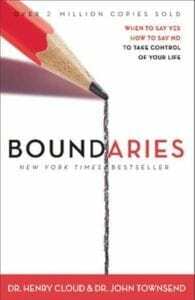 Starting in January 2018, Thursday lunch hour networking for local business women and an opportunity to explore the bestselling book Boundaries, by Dr. Henry Cloud and Dr. John Townsend. Our discussion time will be guided by professional counsellor, Amanda Ratzlaff, RPC-C.
ALPHA is for anyone interested in exploring the meaning of life. In a friendly and casual setting, meet new friends over dinner, learn about intriguing topics of the Christian faith and join in the discussion. We will post the dates of our three-month program as these become available.